Under-rated western from veteran director Richard Brooks. The movie came a couple of years after The Magnificent Seven and a couple of years before The Wild Bunch, and as a result has a strange feel, combining romantic adventure with end-of-an-era cynicism and moral ambiguity. Brooks tries hard to find some sort of middle ground, in terms of both plotting and dialogue, and manages it more or less up to the end. Brooks also makes nods to Leone, in particular with the cast introductions. 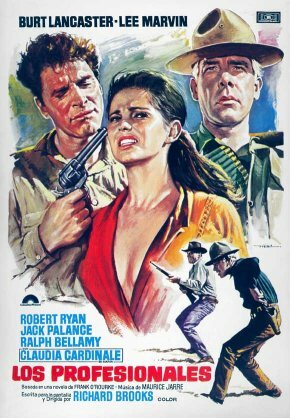 And it’s a perfect cast: Lee Marvin keeps it serious and he’s just about perfected the role by this time, Burt Lancaster gets all the witty lines and leaps around like an acrobat, and Claudia Cardinale looks like she’s worth going on a suicide mission to rescue. The movie is beautifully photographed by the great Conrad Hall, although the odd composition involving Cardinale strays into Russ Meyer territory. The rest of the cast are just as good. Woody Strode says nothing brilliantly, and the big surprise is Jack Palance, who as the movie requires it, creates an unexpectedly sympathetic villain. In the end it doesn’t quite match up to the other movies mentioned above, and has largely been forgotten, but it still deserves its place in that company.